People ask me “why do I run?”, why does anybody run?.. We all run for different reasons, some want to be the fastest, some don’t mind being the slowest and some are happy just to finish! My running journey all started on New Years Day 2018. My friend Sally took me to my very first Parkrun. I had never ever heard of a Parkrun, let alone ever done one, yet I learnt that this is something that was done every week. I was so surprised to see how many people were there, I was so nervous, scared, excited and very cold. I had no idea how much of an impact that first 5km run would have on my life. So I’m standing at the starting point “Are you ready” the race director shouted, here we go 3-2-1 and we were off. Running round the course I had so many thoughts going through my mind, things like.. What am I doing? I can’t do this, OMG I’m going to die… all the way round. Sally kept me going, I ran/walked all the way to the finish line, when I finished I felt tired but felt amazing at the same time. I did it in 38 mins and 28 secs, little did I know that that would be the first of many many Parkruns. Saturday morning parkruns then became part of my life and I loved it and would get faster and faster with each run. I was also introduced to virtual medals, these were amazing, so many to choose from but each one meant something different, some for my dad, some for my daughter and some just for me, but every one got me out every day and kept me running. I was then told about the Facebook group RunThroughUK Chat, never knew that this group would become my new running family. 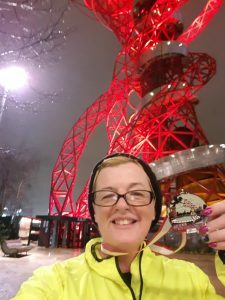 So I booked my first running event with them, this was on 14th February at the Olympic Park and being February it was pouring down with rain but was one of the best nights of my life. 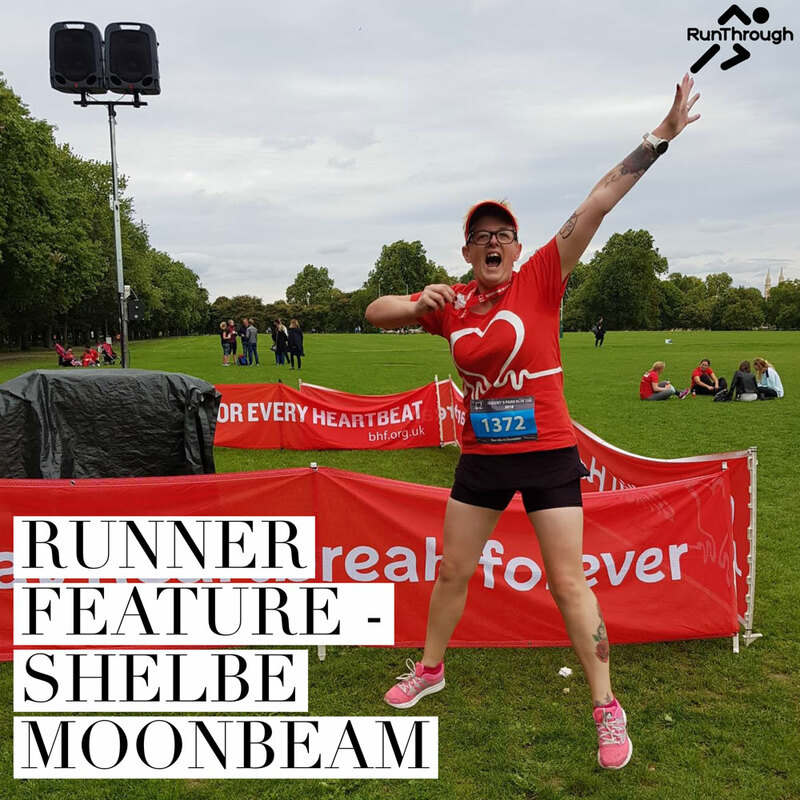 When I arrived I had no idea what I was doing but I then heard a voice shout out MOONBEAM hello, it was a man called Woody (Matt Wood, known by many as Woody is actually one of the co-founders of RunThrough), he showed me what to do and made me feel very welcome. I did my run in 33mins and 3 secs and I was wet through but felt fabulous, got my very first medal and I was so proud! My goals after that were to get what they called a sub 30 5km and sub 60 km, I had no idea what people were talking about but over the next few months I found out what it was all about. So I started clocking up the miles each month, 25 at first, then 50 then 100, doing more running events and more virtual medals, by about June I had done about 400 miles and oh how my body was changing and my legs were looking fabulous!! I then decided to join a running group called Spartans, I had never joined a club before this as I find this really hard to do but they were so friendly and made me feel real welcome, I know train 2 to 3 times a week and love it. In September I did my very first 10km non stop run, it was a charity run and because people had sponsored me to run, I felt that I had to do it non stop, cos walking would have been cheating, so I pushed and pushed and finished it in 1 hour 7 mins 49 secs. I felt on top of the world and so proud of myself. After that my runs got better and better and my times got faster and faster, and I knew that sub 30 would be mine one day. However I did have a few runs that I hated and I felt rubbish after and I had let my self down but I soon learnt you have to have a bad run to get you to your next great run. In October I was nominated for Spartan of the month, due to my hard work and determination with my running! I am now on my 24th parkrun and my PB is 30 mins 39 secs, that sub 30 Parkrun will soon be mine, I have so much faith in myself – I know I will do it and never give up. I did another run at the Olympic Park on the 1st November I did 5km in 30 mins 22 secs, so as you can see I’m getting better and better with every run, I do train at the gym, I do love a run on the treadmill and I have got a few sub 30’s on there but I just need to learn how to do it out side! This has been best year of my life, running has completely changed who I am now, I am a much stronger, more confident person and I now believe in myself that if I want to do something I can, I make it happen no one else just me. I am planning on writing a book next year about the first year of running, it may happen it may not but having a goal in life is what keeps me going, I have so much more to give but what ever I do or where ever I go, I know running will always be a part of me now, so if I can do it you can too, so never give up, just believe in yourself and great things will happen…..